Back Board: Mdf - Wall or desk mountable - Portrait / Landscape. The French Capital's most famous landmark - The Eiffel Tower. Black and White print of the Eiffel tower. "The Tower". Beautifully finished on 200 gsm fine art paper. Print Size: 17" x 12" / 42 x 30 cm. Professionally produced giclee print. Stack of Designer books with the Eiffel Tower proudly standing tall, adorned with a black bow. Just below the Eiffel Tower is the Iconic Chanel Logo in faux Glitter Effect Gold. At the base of the Designer Books is a cluster of Pink Peonies. Fine Art Giclee Matte Canvas. Exclusive Designs to Bold Bloc Design. 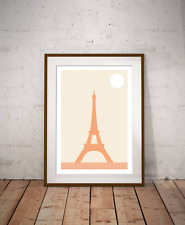 Framed Eiffel Tower Print - “lightening”m - Great Gift / Present Frame measures 15 cms x 20 cms. (6” x 8”) Postcard print size 10 cms x 15 cms. ( 4” x 6”) Can be wall mounted or stand alone using support on frame back. See through plastic protection at front of print. Will post second class small parcel post to UK only. Can combine postage with other items purchased. Please see my other auctions. Thanks for looking. Soft crepe silk scarf in used condition, some fading along one edge . Very unusual design. Hand rolled edges. It measures approx 70cm x 73cm If you wish to buy more than one item I will combine postage, please request a combined invoice. If there is anything you would like to know about an item - please ask. We are having a clear out of items that we no longer need or use, so most items will be in used condition and may have been stored. Please note that the postage cost to some remote postcodes will cost more for larger items. Picture of Eiffel Tower - signed print - pen and ink - Paris print. Pen and ink Giclee print on archival paper. Signed limited edition. Picture can be printed on A4 as. 20cm x 25cm. VINTAGE FRAMED PRINT EIFFEL TOWER TOUR EIFFEL PARIS SIGNED ORTIZ ALFAU. Dispatched with Royal Mail 2nd Class. 'Eiffel Tower with Hearts'. This Artwork has been printed directly onto an antique dictionary page. Dictionary Page Art. The Antique page was salvaged from a large Dictionary published. between 1888 and 1905 and has a lovely warm tone.